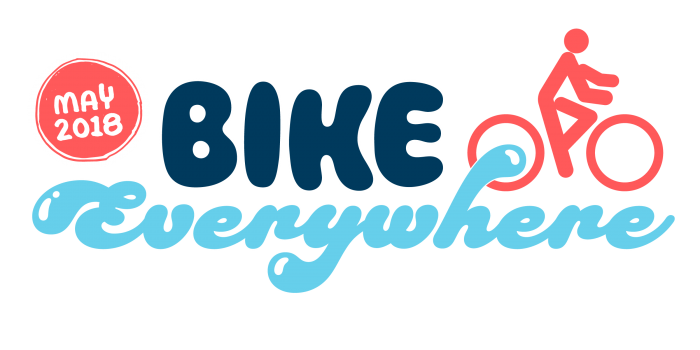 Whether you focus your riding on a local Bike Challenge during Bike to Work Week or join our #BikeEverywhere Challenge — or both! — Washington state has lots of ways to tally up your riding. As the #1 Bike-Friendly State in the nation for eight years straight (most recent designation was in 2015) we have people bicycling all over the state all year round. The state’s commute trip reduction law provides ongoing opportunities to tally vehicle miles avoided and get a chance to win prizes, too. If we’re missing your local Bike Month event let us know and we’ll add it to the list! 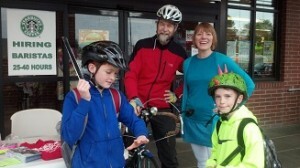 Bellingham/Whatcom County: Bellingham and Whatcom County hold a Bike to Work and School Day that includes celebration stations offering treats and applause for everyone on a bike . King and Snohomish Counties: Cascade Bicycle Club organizes Bike to Work Day and other Bike Month activities. Community Transit partners with Cascade for Bike to Work Day in Snohomish County and has a list of BTWD stations in Snohomish County. Pullman: Pullman Parks & Recreation, Bike Month Challenge. Participants log their bike miles on a calendar throughout the month to become eligible for prize drawings. Lincoln Middle School organizes a Bike to School Day on May 6. Skagit County: Bike Walk Mount Vernon has partnered with our Bike Everywhere Challenge to bring a Bike Month Challenge to the region via the Skagit Valley League. 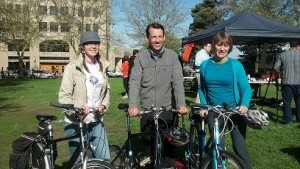 Bike Walk MV also organizes Bike to School Day and Bike to Work Day events. Spokane: Spokane Bikes puts together Bike to Work Week and the week-long Commute Challenge with help from partners at Spokane Bicycle Club. Tacoma/Pierce County: Tacoma/Pierce County residents have two challenges to choose from for Bike Month: the Bike Commuter Challenge and the Bike Everywhere Challenge. Learn more at Pierce Trips’ Bike Month page. Thurston County: Intercity Transit, Bicycle Commuter Contest in May – the longest running bike challenge in Washington! They also host Bike Stations on Bike to Work Day. Thurston County Bike to Work Energizer Station, 2014. Duncan Green (left, standing with Barb Chamberlain) has organized Thurston County’s Bicycle Commuter Challenge for years.